The Harriers 2:18 Run Elk / Beaver Ultras take place just outside Victoria, BC. The race distances range from 40km, 42km, 50km, 50mi, to 100km all of which incorporate 10km loops around the Elk Lake and Beaver Lake. The course is mostly gravel, a couple short dirt double track sections, and one glorious fast short paved section. The course is pretty flat and fast overall, it’s rated as one of the faster ‘trail’ races in Canada. The Canadian 100km National Championship occasionally uses this course. This year (2015) was a Championship year and I ran it. Here’s my experiences. Stephanie and I stepped out of the Victoria airport into the sweet smells and warmth of summer. Steph would be crewing for me – giving me a hand with hydration, fueling, and moral support through the race. Our first order of business was to grab my race package downtown at the 2:18 running store. At the store I chatted with a number of participants and veterans of the course. Some of the veterans spoke of the difficulty this course presents – it’s flat, the pace is constant, there’s no chance to change gears. The reality of the distance I would be running along with some doubts about finishing started creeping in. I continued with my carb loading rituals: lots of rice, fruit, some pasta, water, and loaf of local focaccia. Then for the remainder of the day we kept things low key with lots of park time and reconnected with some old friends – I’d worked and lived in the area for a year while saving to go to Japan. Around noon I noted the temperature had hit a high of 27C (80F) – temperatures a lot higher than I’d been training in. That night we checked in early. The wake up call went off (4am), I was feeling rested, confident and a bit apprehensive. We made a quick stop at the closest coffee shop (Tim Horton’s). I sucked back an extra large coffee diluted with cold water to aid in chugging, and we were off to the Elk / Beaver Lakes where I’d be running ten 10km loops through the course of the day. I nearly arrived late, with just enough time to get through my pre race ticks: tie shoes, test the fit, retie shoes, retie shoes, jacket on, jacket off, retie shoes. Should I wear arm warmers? We toed an imaginary line in the grass, the race director started the countdown, and we were off! The race was on! 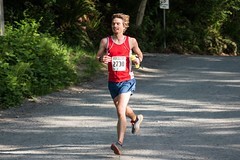 A small pack or runners formed a gap and took off from the start – all race distances start at the same time, some of these speedsters were in the shorter distances. I lingered behind sticking to my plan of 45min laps. For most of the first, second, and third lap I studied the course and chatted with any runner that would talk. Steph was doling out the snacks – one gel every 30 mins – and water at the primary aid station. I continued to trail behind the pack. Steph reported that I was gaining time and by my fourth lap I started passing runners. At 60kms I was leading and now banking time. I was still feeling pretty good and felt like I was running easy. My seventh lap was coming up, this would be the special ‘no man’s land’ lap – I’ve never run beyond 60kms. Around this time we were also entering the heat of the day and the trails were quickly losing their shade. The temperature was hovering around 25C (77F). On this seventh lap I grabbed a handful of candy in place of my gels (possibly a mistake of not sticking to my nutrition plan). I clipped through 70km just as a familiar and very unwelcome twinge in my right inner calf hit me. Calf cramp! NO GOOD! My calves and I have a rocky history. I bombed into the aid station, downed some salt, more water, and potato chip (chips yum!). Steph thought I looked frazzled, so she jogged with me for a bit. 500 meters into our jog and my calves flat out seized. Toes pointed downwards, unable to balance, I stretched them out. I started trying to run, they cramped again. We stopped, I took a bio break (my hydration was good). I mumbled to Steph that I wanted to stop running now. We were only 500 meters from the aid station and 600 meter from the car. Being so close to a comfy seat was mentally difficult. Steph slapped me on the back, gave me a quick pep talk, and we jogged a bit longer. My calves continued to cramp. I made it two more kms into my 8th lap (82km), then told Steph I needed to plod through this alone. I made it another 1000 meters to an unmanned water station on a picnic table. Both my calves were still spazzing uncontrollably. I sat on the table pinching and kneading my muscle in effort to release cramp. I started doing some math – another 17km at calf cramp pace might take three hours! I started making deals with myself. I thought “if I get passed while sitting here then I’m walking back to the car”. I spent 20 minutes sitting at this unmanned water station downing water. No one passed. Weird thoughts were rolling through my head, but one comment I had heard at race from a fellow who gutted out a terrible race stuck out. His comment was something along the lines of: “those front runners don’t know how to suffer, they won’t think twice about dropping when they aren’t making their time goals or when it gets tough”. My time goals were slipping, but I thought I’d try to gut it out. Besides I had made it 83% of the way. I was so close – 17km is roughly one loop of the Calgary Reservoir. I stood up and started shuffling. I made it 500 meters just as second place passed me – now I was the hunter, one of my favourite place to race. Another 750 meters and I was good. I tried to run, no cooperation, back to the shuffle, but I wasn’t losing too much ground to the new leader – it felt like we were two turtles racing. Another 1000 meters of shuffling and my calves started cooperating! Although my stomach was sloshing uncomfortably from all the water I had drank. By the end of 8th lap I had regained ground. I was back in first, and the legs were cooperating. Well… cooperating enough. I passed through the aid station for the last lap just as my watch died. This lap would be in the dark, based completely on feel. I was being chased and knew I had to make this lap count and also knew my calves might not cooperate. I ran through this final lap faster than my previous three (factoring out the aid station stop). I continued to regained time and crossed the finish line with a smile. I was happy to have completed the whole thing, happy to be able to sit down, and being the Canadian National 100km Champ for 2015 was a nice added bonus. It’s fair to note that this is a small event. I was competing against twelve other men and my primary competitor was likely beat up from his marathon the weekend prior. My goal was to finish in the range or 7.5 to 8 hours. I finished in 8 hours and 8 minutes. My average pace ended up being 4:53 min / km. I lost 19 minutes during my calf cramp lap. Aside from the cramping I enjoyed racing the longer distance, but I was VERY surprised at how difficult it was to self pace – after five hours and leading I had a hard time talking myself into working harder. In a National Championship year they do not allow pacers on this course, I’d love to run a flat 100km with a pacer or in a pack with similar goals. It’s interesting to look at the course results and see how they differ between the years that allow pacers and the years that don’t. Overall the event was really well organized, the camaraderie was fantastic, the trails were great, and the eight hours of running went surprisingly fast. I’d run this race again and will definitely be running another 100km event. In retrospect I should have stuck to my nutrition plan, I need a watch with a longer battery life, and I’ve already started with the calf raises. Also, I need to be faster in the aid stations in the later stages of the race. 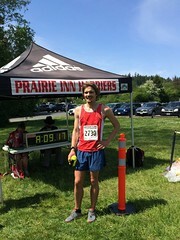 Here’s my track and an official race report from the Prairie Inn Harriers Running Club. Special thanks to Stephanie for her fantastic crewing!